Honored with the Liebster Award! How wonderfully flattering to have been nominated for The Liebster Award from Virginia at Our Growing Paynes! 1. List eleven random facts about yourself. 2. Nominate eleven bloggers for the award. 3. Let them know about the nomination. 4. Answer the eleven questions you were asked when you were nominated. 5. Ask eleven questions for the new award winners to answer. I really hate shopping for anything but food. I love food shopping and everything about food. If there were someone who would pick out my clothes, shoes, accessories and say “Here, wear this today, let me do your hair and make-up” I would be a very happy girl! I float on the top of water really easily. Fresh water, salt water, swimming pools, I can float. I am also afraid there is a fish out there that wants to eat me. gulp. I believe the lake only has little fish. . . Going for a good gallop on a fast running horse is an exhilarating experience! We used to do that as kids, but now there’s nowhere to go for a full gallop. Anyway I’d need a horse and don’t have one of those either. I don’t drink distilled alcohol. Love wine and champagne. Beer, not so much unless its a Stella Artois on Blvd. St. Michele looking at Notre Dame. I have started a Spoon Feast Pinterest page but don’t know how to get people to find it! Same with Etsy, I have a store but I can’t find it anymore so I gave it up. geesh. But really, Can anyone find the Pinterest page? I should have a contest. . . I know a lot about gemstones. I studied once to be a Graduate Gemologist. I never took the final exam. Message: Don’t Give up! Finish what you start! I adore flowers as much as food. I like to capture the beauty in photos. I should give up trying to grow vegetables and grow a nice seasonal cutting garden. Hum! That sounds like a good idea! Have you ever eaten/tasted a sage flower? Simply amazing! First the beauty, the color and the scent and then how it disappears like a drop of honey on your tongue , really, have you ever had that?! I insist you must try it. Keep your eyes out for fresh sage flowers. I talk to my plants and believe it does them good. My house if full of plants, inside and out! I know some of these bloggers will respond and pass this award along and others won’t. They all deserve a shout-out and a visit anyway! Amy at A Health Life For Me inspires me to make healthier choices. Clarissa at Dishing it Out With Clarissa has something for everyone. Pretty Nifty Blog! Dinner of Herbs is fresh and vibrant! LuLumiere sees the world with wonderful eyes and captures it in photos. Anne at Uni Homemaker shares her cooking adventures with enthusiasm. And CityHippyFarmGirl shares great discoveries and is a fun read. What inspires you to write or photograph? What did you eat for dinner last night? Who made it? What do you make in your kitchen that people would find unusual? Do you garden? Any luck? What do you grow? What is the greatest challenge you face now? I vaguely remember traveling on a train with my mom to Canada from Michigan. My sister and I would hold coloring book pages to the window and color the opposite side, for some reason we were highly entertained by this. 2. What food would you like to try but haven’t had the chance? I have had a vast food exposure all my life, but I think it may be Durian if I can get it past my nose! 3. If you were able to form a charity what would it be? I would start a college scholarship to be awarded to anyone who needs funding for college. There would be qualifying criteria. Additionally, i would start a business incubator to help people start their own businesses and gain financial independence, and the knowledge and the ability to do so. 4. What fashion trend should be banned? The one that has everyone showing their undergarments! Cover up for crying out loud! I don’t need to know your bra color or that you wear superhero underwear. Enough of this PLEASE! 5. What makes you crack up? I laugh at the silliest things. Mostly from observing people and interactions. 6. What is your pet peeve? Incompetence and people who don’t follow through with what they say. 7. How far do you live from where you were born? I was born in Mt. Clemens, Michigan but never lived there. I’d be guessing to find it on the map. I currently live in a totally different part of the USA, the Southern States and love it down here. Charlotte, NC is my home but I have relatives all over. My mom is from Nova Scotia and my Dad, Michigan so we are well represented all over it seems. 8. What is your favourite season? 9. What is your day job? I am a Certified Executive Chef (lots of other certifications too) and teach culinary school at the largest community college in North Carolina. 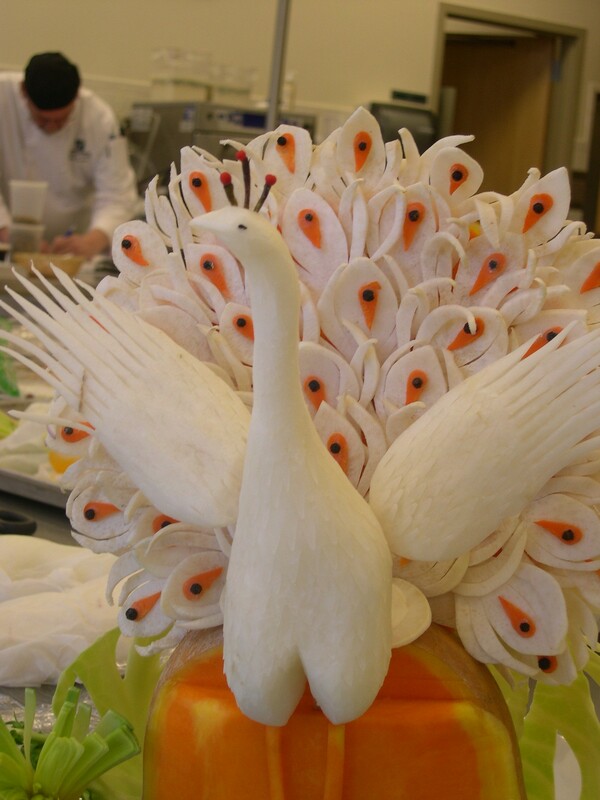 I love teaching and I especially love teaching Garde Manger which is where students learn all about salads, sandwiches, curing meats, pickling, making condiments, smoking, sausages, and artistic carving skills. 10. Where do you want to retire? While my initial reaction is to say in the South of France, a nice big country house on a clean deep lake would be rather nice. Location will have to be determined later but somewhere in the American South or the South of France. 11. What is your favourite hobby? HA HA HA HA HA HA ! COOKING! Surprise! Thank you! It’s great to see students bloom when given a chance! You’ve inspired me to go buy some cowboy boots, for my skirts of course! How lovely to nominate me, thank you so much! Have a lovely day.